9 March 2015, at 9:34a.m. SPAIN - The Cassanyé family from Lleida is entirely satisfied with the liquid feeding system that supplies all their pigs, which was installed by Big Dutchman. Catalonia, one of the autonomous communities of Spain in the north-east of the country, has much to offer. Its beautiful beaches and the capital Barcelona are visited by many tourists every year. What most of them do not know: the Catalans are very successful pig producers. This is not only proven by the many farms breeding the Iberian pig in the region around the city of Lleida. A large percentage of the Spanish pig stock is produced in Catalonia, some of it by first-rate farms who are breeding on European top levels. A prime example: The Gescaser farm of the Cassanyé family in the province of Lleida. The family started keeping pigs in 1977. Since then, the farm has grown continuously. Today, it houses 1,700 sows in a closed system. An excellent performance of 32.38 weaners per sow and per year in 2014 was recognised with the much sought-after 'Porc d'Or con Diamante', which is awarded annually for outstanding achievements in pig production. The Porc d'Or is sponsored by the Spanish Department of Agriculture and the Catalan agricultural research institute, IRTA (Instituto de Investigación y Tecnología Agroalimentarias). Antonio Cassanyé has experienced first-hand how much work went into the farm before its results were honoured with this award. The managing director explained one of the recipes for success. 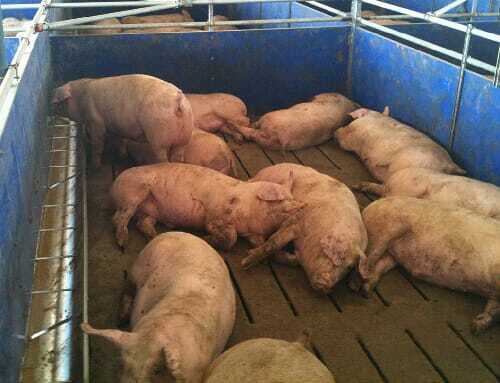 He said: "We continuously analyse production flows in our pig houses in a very detailed manner. The feeding system is a very important factor in this regard." The Gescaser company had started to feed all animals with liquid feed as early as in 2006. One of the advantages for the family business, which also cultivates its own land: the home-grown maize is ground and fed to the pigs as corn cob mix (CCM), which helps reduce costs. The pig finishing pens are equipped with longitudinal troughs. Naturally, feeding time is followed by a siesta. In addition to the housing equipment, the liquid feeding systems for 1,700 sows, 6,600 spaces for weaners and 7,500 finishing pig places have been provided by the German pig equipment supplier, Big Dutchman. Two HydroMix liquid feeding systems supply the sows and finishing pigs with feed. In the service centre, the gestation area with group pens and in the finishing house, the feed is dispensed into longitudinal troughs. In the farrowing area, each sow receives her feed individually in her farrowing pen. Thanks to the fact that HydroAir uses compressed air, even the smallest portions of feed are transported to the trough without residues and dispensed here. The feed lines, therefore, remain free of feed remnants. The Cassanyé family is entirely satisfied with their liquid feeding system. And they can be, considering the results: feed conversion of the weaners has improved greatly. The weight of the weaners has increased after the lactation phase since starting to supply the sows with liquid feed. Mr Cassanyé explained that, of course, the system requires much management know-how from the staff. He said: "However, the system is very easy to operate after some specific and individual training. It has clearly proven its worth." He is very pleased with eight successful years of liquid feeding courtesy of Big Dutchman. To take a look at Big Dutchman's systems for sow management, pig finishing and piglet rearing, click here.